Authority in the Spirit Realm Whether you know it or not, there is a war for the souls of mankind raging in the spirit. To win the fight of faith you need to know your authority in the spirit realm. In Authority in the Spirit Realm, Ed Horak clearly outlines the true nature of spiritual warfare. He underscores how Jesus' shed blood at the cross has already won your victory, and he shows you how to play your part in enforcing the adversary's defeat. In a fascinating chapter entitled 'Know Your Friends', Ed Horak outlines how you can cooperate with God's angels sent by God to minister to and for you. 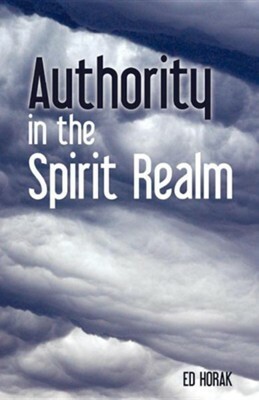 Authority in the Spirit Realm also exposes the tactics of your spiritual adversary, and will equip you to walk victoriously in both the 'permission' and 'power' of the name of Jesus. Ed Horak's vision is to help equip the body of Christ with a fresh word from God. In over 30 years of teaching and preaching ministry, Ed has stirred up God's people in his native Africa, Europe, England, Scotland, Australia, and in the United States. His practical, easy to follow message of power, hope and change has helped many fulfill their God given dreams. I'm the author/artist and I want to review Authority in the Spirit Realm.